I have experienced some crazy unusual sickness and injury over the last few months. I’m baffled as to why this is so I’m going to try to work it out, and definitely boost my immunity back up so it ends and so I feel well again. Clint and I eat 90% Paleo, get lots of nature time and I get “nakey bakey” most days (a new name for naked sun time my friend recently came up with. Love it! ), so maybe some stress is the underlying cause? Well, whatever it is I know my eating could be improved a little, especially while my immune system is obviously weak. One of the most popular natural health tonics today is raw juice. We, though, are not fans of regular juicing. Ooh, controversial…! The reason? There are two main ones: 1. Humans need to chew their food most of the time; our stomach enzymes that digest our food need to wake up to be ready for the food to arrive and that happens in the mouth when we salivate and CHEW! 2. Juicing removes a large portion of the essential fiber in the foods blended up. That’s wasteful and not healthy. But some of the foods that go into making up ‘health tonic’ or ‘superfood’ juices can be pretty darn healing, so why not utilise them in a way the body can better use? 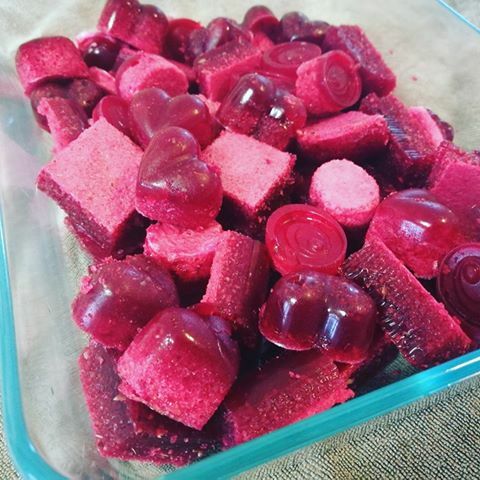 These are really easy to make (as are most pure gelatin recipes), can easily be changed to suit tastes and allergies, and are easy to grab from the fridge during the day to get some goodness into the body. Want to know how to make them yourself? Well alrighty, here you go! 6 tbsp pure beef gelatin powder (grab some from Gelatin Australia here). Tips: Use half as much gelatin if you’re wanting to make jelly cups instead of lollies. Tips: Add another tbsp gelatin for really firm lollies, especially if using molds. Use half as much if you’re wanting to make jelly cups instead of lollies. Optional: Stevia powder or raw honey to your liking, to sweeten if needed. Pour water into a small-medium saucepan, stove turned off, and gently sprinkle the gelatin powder evenly over the surface of the water. Once all the gelatin is on and appears translucent (this is called “blooming”) you can turn the stove to a medium heat to gently warm the liquid up. Use a whisk to stir as it heats up. Once all gelatin granules have dissolved pour half the liquid into a blender jug along with the diced fruit, veg and ginger. Blend on high until you have a fine mixture with as few chunks and lumps as possible. If using a sweetener, add it to the blender to combine. Pour the remaining gelatin liquid in and stir to combine. The more gelatin you blend with food the frothier the mixture becomes and ends up setting with a thick layer of froth. I prefer the texture of a bit of froth, not too much. For almost no froth blend the foods with just enough pure water needed then gently stir the gelatin liquid in. Possibly add a smidge more gelatin to the saucepan if you go with this method. Once the mixture is blended to your liking you can pour straight into silicon molds or into a square/rectangle container to create a gummy ‘block’ to slice up once set. Tip: if you’d prefer less texture from the food ‘bits’ then simply strain some of the liquid through a fine sieve but keep in mind that’s where a lot of the nutrients and fiber are. Place in the fridge for a few hours to set firm. Remove from molds and store in an airtight bag or container in the fridge, or slice up the block into small squares. Grab some to munch on during the day and enjoy the pure whole food healing goodness! Include some in the kids or your own lunchbox (as long as it stays cool), take on road trips, include them at parties. Remember, these are versatile. Add or remove ingredients listed for others you’d prefer. Pretty much all of my recipes are versatile so you can adapt to your own tastes and needs! If ALL of my gelatin recipes and all the techniques you’ll ever need to become a gelatin pro, grab my e-book here. Clint and I are going through periods of low and no-sugar eating at the moment because we need to for our health. He’s doing 30 days straight of no sugar and I’m 5 days on / 2 days off -ish. It’s going really well for both of us; we’re each noticing improvements to our health, we’re feeling better, and we’re getting used to some of the swap foods we’ve been eating. I went live on our Facebook page last week giving my tips for no and low sugar eating, because we’ve been through this quite a few times and can definitely give some advice on how to be successful with it. Watch the video HERE. Yesterday I felt like baking so I had an idea of a biscuit I wanted to try. 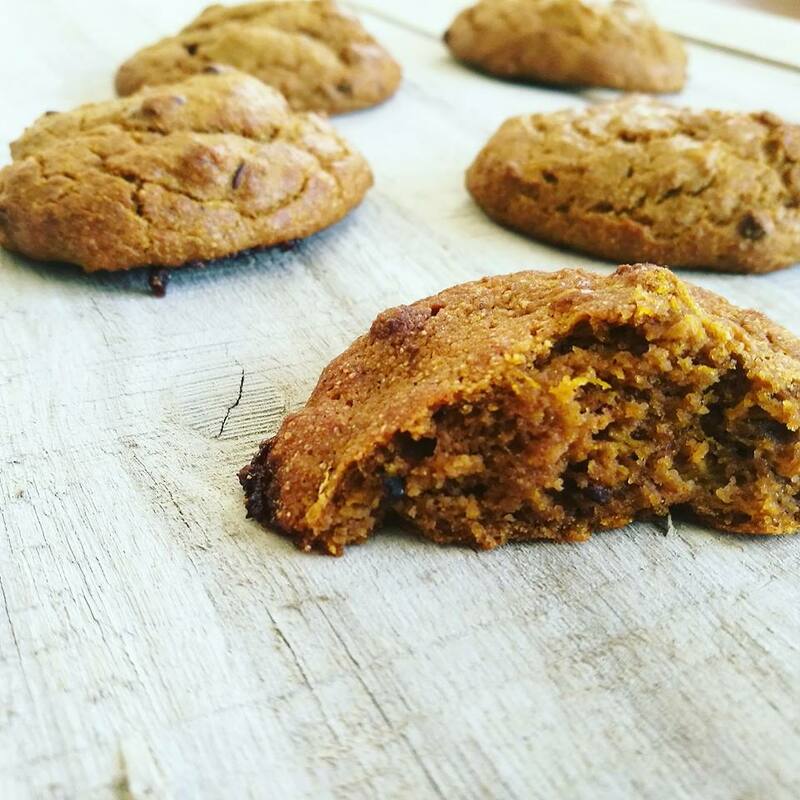 I know pumpkin puree is a great natural sweetener and binder so I decided to try Pumpkin Spice Choc Chip Biscuits and was very pleased with the result! They turned out nice and fluffy, quite moist and surprisingly moreish. The only negative… they’re best eaten warm. Not when they’ve completely cooled down as they then become a bit dry and definitely not as tasty. So if you wait until they’ve come out of the oven and have cooled just enough to still be warm inside, or you heat them up gently if they have cooled completely, then they are delicious! And warm biccies are so much more enjoyable in the cooler months, so it’s not a bad thing overall! If you’re after more sweetness and aren’t on a low/no sugar eating plan, add raw honey or Grade B maple syrup to the mixture, and/or some chopped fresh Medjool dates. Yum! 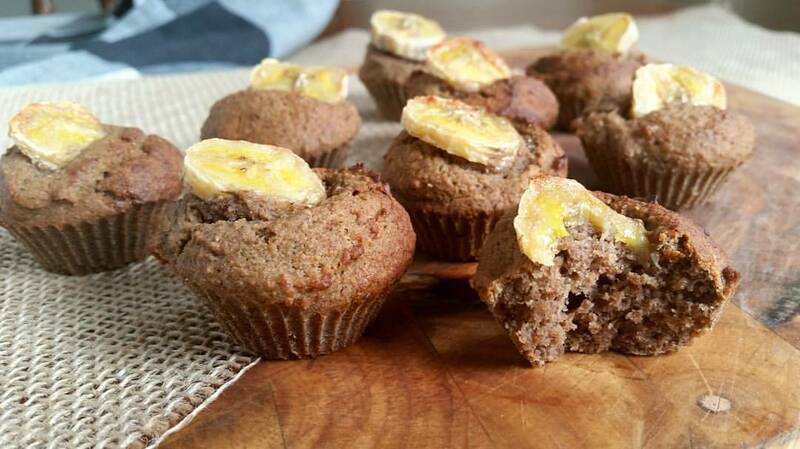 If you’d like ALL of my healthy green banana flour recipes grab my e-books HERE. I don’t always consume nightshades because I have a bit of sensitivity to them, so I often enjoy creating variety with meals totally leaving out tomato, chilli, garlic, paprika.. basically all the good stuff lol and finding flavour without those common flavour options. 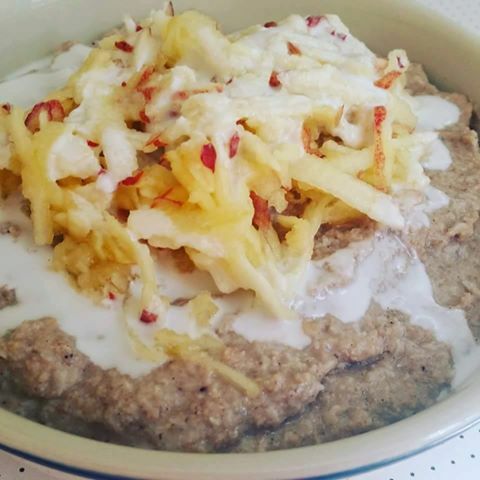 As most of you know, I also like to create meals that are quick, easy and super healthy. Sometimes my creative moments actually work out well and the other night was one of those occasions when I created a new meat and veg dish that got double thumbs up from Clint, woo! AND it made 4 meals worth in one go, bonus! 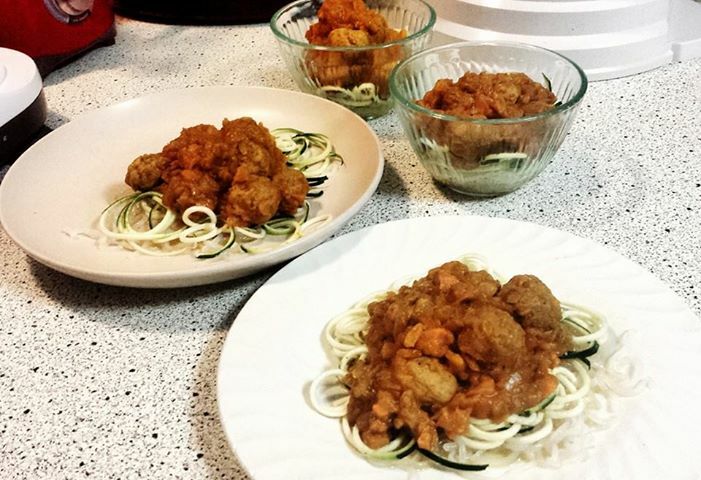 I decided to make meatballs, a non-tomato sauce and have some noodles… and I created Meatballs and Veggies with Noodles 2-Ways – delicious, super healthy, really easy to make, a total win! This made 4 serves so Clint had lunch ready for work the next day, it’s fine to have cold, and I had my dinner sorted for the next night. Yay! 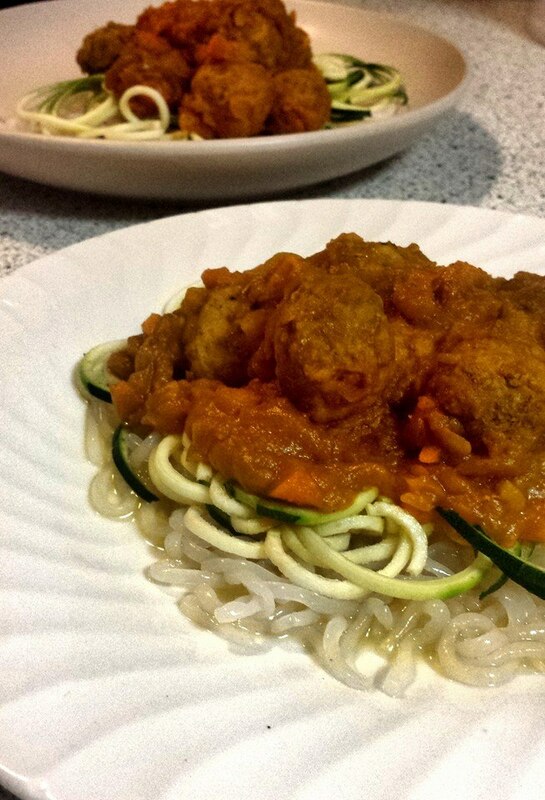 Kids will love this because pumpkin gives sweetness, noodles and meatballs are fun and it’s a bright coloured dish! It’s so healthy because it’s jam-packed full of nourishing veggies, a little bit of meat, the bone broth contains gelatin and essential minerals, the turmeric is anti-inflammatory and the fat in there balances it all out nicely. You could add some coconut amino (with or without chilli and garlic in it) to the sauce to give it a flavour boost. You could use different noodles. You can add different herbs and spices. This recipe is so versatile! Enjoy! Please let me know how you go and how this idea helps you in the kitchen! Last night after another awesome Primal Fitness Class we popped into Woolies to grab something for dinner (yes we still shop at big bad chain supermarkets.. we sometimes need to – don’t judge!) and I had the idea to make fish n chips. Partly because we love making crispy chips out of different veggies (very rarely potato, bit too inflammatory for us unfortunately) plus there were a few choices of wild-caught seafood on special at the Deli. Yay! So we grabbed some beautiful flathead fillets (50% off, why not?! ), a parsnip and a white-fleshed sweet potato to go with the orange sweet potato we had at home. I’d been wanting to try using green banana flour (only my favourite ingredient in the world!) with fish to fry to see how it went… so I did! It turned out brilliantly and alongside crispy baked veggie chips and a serve of lime aioli… dinner was sorted and pretty darn enjoyable (if I do say so myself <wink>!). Here’s the recipe for you guys to make and enjoy it for yourselves! For the chips: Pre-heat oven to 180. Sprinkle salt over the top then place in the oven. Keep an eye on them because your oven may not cook evenly and some chips may cook or burn before others, so place your timer on to remind you to check every 2 or so minutes. Shuffle chips around as you need so they cook evenly. 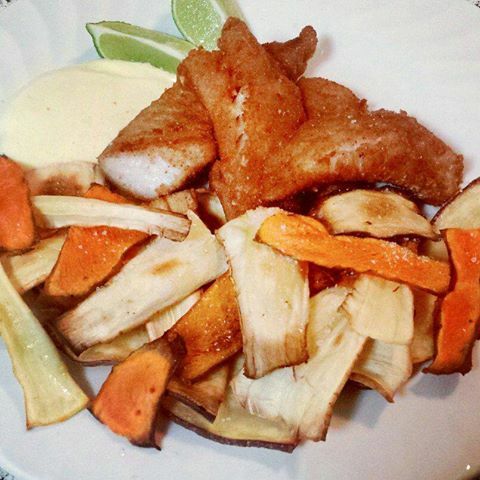 Keep in mind… white-flesh sweet potato hardens before it looks like it’s crispy! So check doneness by tasting a piece for yourself! Once chips are cooked to your liking place them on paper towel to absorb excess fat then place onto plates or serving dish. Alternatively you could fry the chips in a large pan on the stove. our event on Saturday for kids and adults, it’s going to be so fun! That’s not a typo, it is actually meant to read “Our bug adventures”, not “Our big adventures”.. did you get a bit confused there for a second?! If you read the blog post we did about our 2015 Paleo Camping Retreat you’ll know we’re open to eating bugs, because one of our awesome sponsors Primal Collective gave us tubs of roasted crickets! They actually just taste like savoury popcorn, serious! And as we’ve discovered recently catching and cooking up some bugs ourselves.. there’s not a great deal of flavour. Generally speaking anyway. It’s more the mindset and the look of them that’s hard to get your head around. But once you get past that and free yourself of the ick-factor so many people naturally have at first, it’s really quite a positive experience! Humans have been eating bugs since humans first walked the earth. Insects are just another rung on the food chain ladder. But these days, with the modern conveniences we’re used to such as shops selling pre-cut pieces of attractive-looking muscle meats.. we are really out of touch with what our food originally looked like, where it comes from and how it lived before it served the purpose of feeding another form of life. I.e. Us! The fact humans do naturally eat bugs for survival and fuel seems to have been forgotten. So because this is such a unique thing in the eyes of most, Clint and I thought we’d write about our bug hunting and eating adventures in the hopes of inspiring others to get on the insect train! Our friend Dan the Aussie Paleo Chef has been eating bugs for a while. He often sends us photos of scorpions and other insects he finds in the bush near him in Canberra and then cooks up at home in coconut oil and other typical paleo flavourings. He’s really inspired us, we’d wanted to do this ourselves for a long time but were always a bit nervous about the safety of it. There’s so little information on the internet about which bugs are safe to eat, we just didn’t want to eat something that ended up being poisonous. Of course! But a few weeks ago a new friend of ours saw an article we shared on Facebook by Stirring Change on eating dehydrated ants and indicated she was keen to try this herself. So we asked if she’d like to come on a bug hunt with us and she jumped at the chance! We picked a day and a location and off we went into the bush to catch us some bugs! Our friend Sarah and her son had a list of edible insects they’d found online and Clint and I were pretty well read on the bugs in the area that would be safe to consume. We took some gloves, plastic containers and headed down the main track of a local parkland, turning over logs, sifting through leaf litter and basically looking in all the places we figured bugs would be. 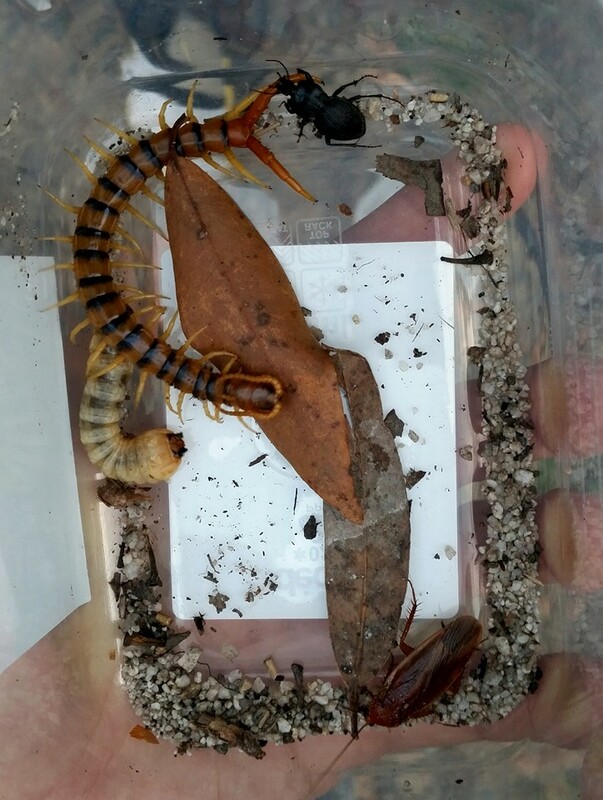 That big sucker is actually a giant centipede! Plus there’s a witchitty grub-type thing, a bush cockroach and a beetle. 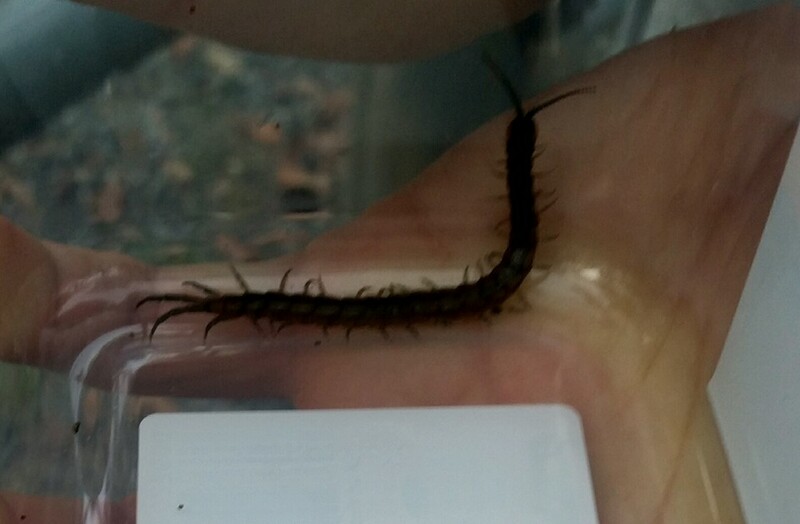 This little guy is a regular centipede. Not to be confused with millipedes which we read are not safe to eat. To tell the difference, centipedes only have one leg per body segment, whereas millipedes have more. “But don’t centipedes contain poison?” I hear you say? They do indeed but we’d read that cooking the bugs cooks out this poison, making them totally safe to eat! Only 4 bugs (the beetle didn’t seem worth it so we didn’t include him) and 4 people to share around to.. hmmm. Sarah ended up letting us take them home to eat. I think she was still too nervous to cook them up herself! We didn’t mind! She had wanted to score a haul of ants to take home to dehydrate, but when we started trying to catch some ants at the beginning of our trek we soon realised they are pretty hard to get! They’re really quick, so when you manage to get one or more in a container, you have others trying to get out at the same time. We figured we’d need to design our own ant-catcher contraption, or go home and Google for some ideas. So that’ll be for another bug hunting expedition! Clint and I took these few bugs home and fried them in just coconut oil and salt. 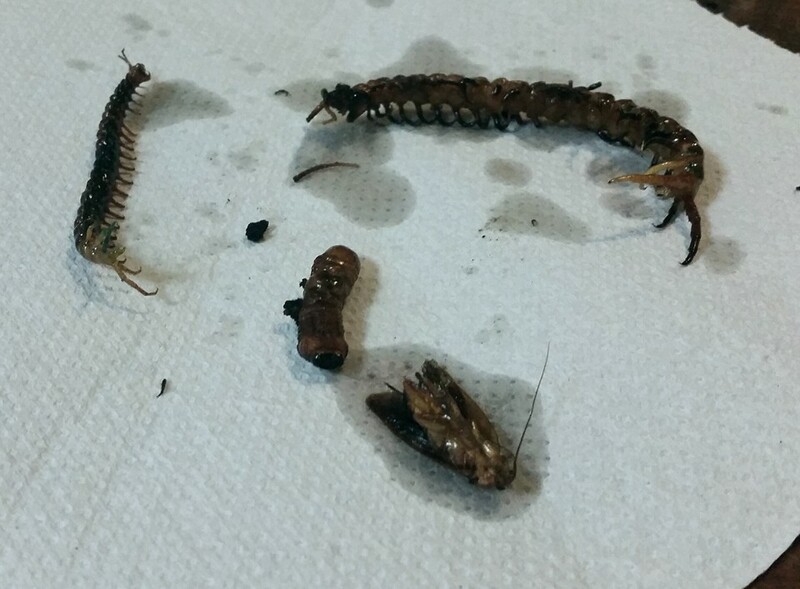 The centipedes and roach turned out perfectly; nice and crispy. The grub, however, wasn’t so nice, but we found out later from our friend The Free-ranging Chef that we needed to cook it slightly differently so we’ll definitely keep that in mind for next time. Yes, there’ll be a next time! We’re already planning the next Bug Hunt! Cos, well, you could say … we’ve caught the bug for it..! haha sorry, couldn’t resist! Next week we’re planning to try catching ants with a homemade trap (cos they are fast little buggers and tricky to catch!) to dehydrate. Plus more general insects so we can keep experimenting and hopefully enjoy a bigger feed! So as well as the actual bug hunting, we also eat farmed bugs. The roasted crickets are great, but recently we also found out about cricket FLOUR! Or “powder” to be exact, because of the texture roasted crickets become when broken down. Our new friends from Bugsy Bros in Brisbane sell packets of cricket powder and kindly gave us some to play around with. I’ve been cooking with it and really like it! I even used it in a recipe I gave at my last Sunny Coast cooking demo… Mini Banana Muffins… and the tasters when down a treat! They’re a great addition for kids and adults lunchboxes because they’re small but filling and nourishing. That extra protein helps you stay fuller longer, and the exclusion of nuts, and even coconut flour, means there’s less chance of bloating and feeling ‘heavy’ after eating, unlike many paleo muffin recipes. Would you like the recipe for the muffins so you can easily test out the cricket powder without it being a really strong and overpowering taste experience? And also to hide it from the kids? Here it is! Tip: place slices of banana on top before baking to make them prettier! 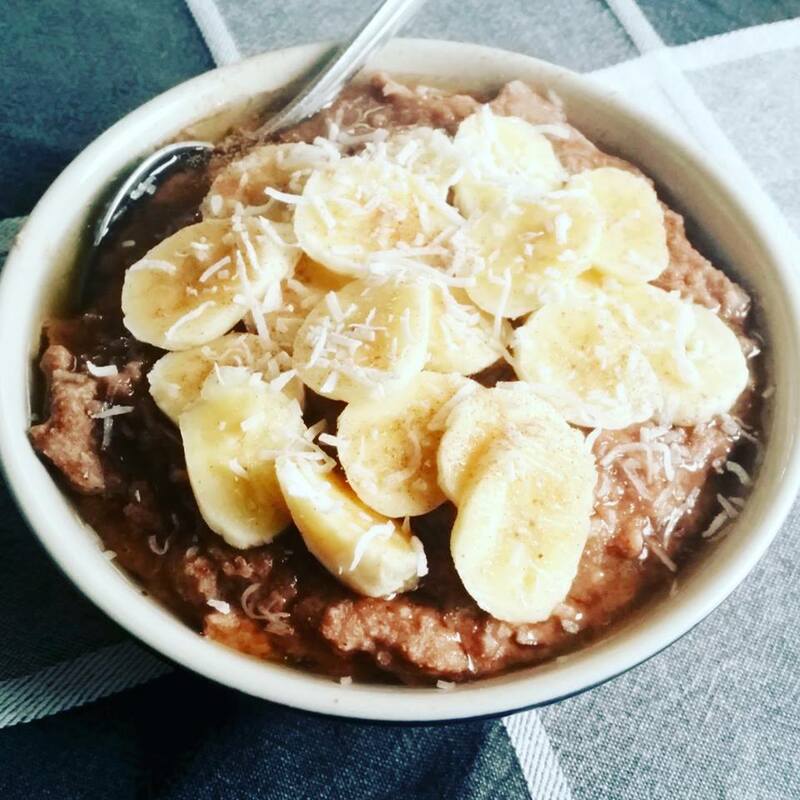 Ideas: swap banana for pumpkin or sweet potato (to help bind and moisten but with less sugar), add dates for extra sweetness, add whole blueberries, turn into savoury muffins with grated veggies and savoury spices/herbs… there are so many ways to change this recipe to suit your health needs and tastes! These muffins are nutrient-dense so a few are very filling and great for school and work lunchboxes. They are nut-free which is great for schools or when having kids’ friends over who have allergies. They can be made coconut-free by using ghee or olive oil instead of coconut oil (the cricket powder is high in protein so it’s a perfect swap). Storage Tip: Double the quantity, make large batches and store in bags or containers in the freezer to thaw and use when needed! For use within a few days store in an air-tight container out of the fridge. So there you have it.. you’re up to date with our recent bug adventures and even scored a healthy and yummy recipe you can use insects in! Please let us know how you go with bug hunting and/or eating, we’d love to hear from you! DISCLAIMER: All content provided on this Under the Primal Influence blog is for informational purposes only. The owner of this blog makes no representations as to the accuracy or completeness of any information on this site or found by following any link on this site. The owner of undertheprimalinfluence.wordpress.com will not be liable for any errors or omissions in this information nor for the availability of this information. The owner will not be liable for any losses, injuries, or damages from the display or use of this information. 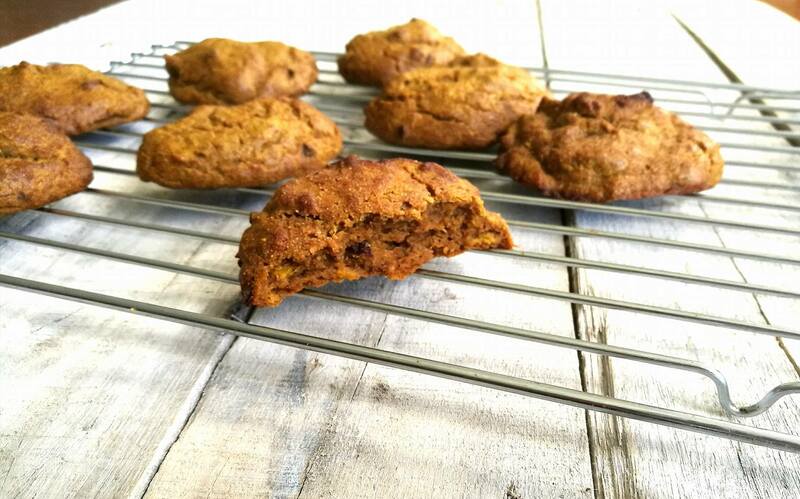 Thanks to Sunshine Coast Paleo Lifestyle Meetup Group member Andrea for sending us this winning recipe! Andrea kindly gave us a batch a few months ago and we loved it. Clint was eating it with a spoon it was that good, so we thought it about time to give you guys the recipe so you too can make and enjoy this deliciousness! Add all the ingredients to your blender or food processor and process until completely reduced to a fine, liquid puree. Transfer that puree to a medium saucepan and bring to a boil. Lower the heat, partly cover and simmer for 45 to 60 minutes, stirring from time to time, until the sauce is nice and thick and darker in color. Kill the heat and let the sauce come down to room temperature. 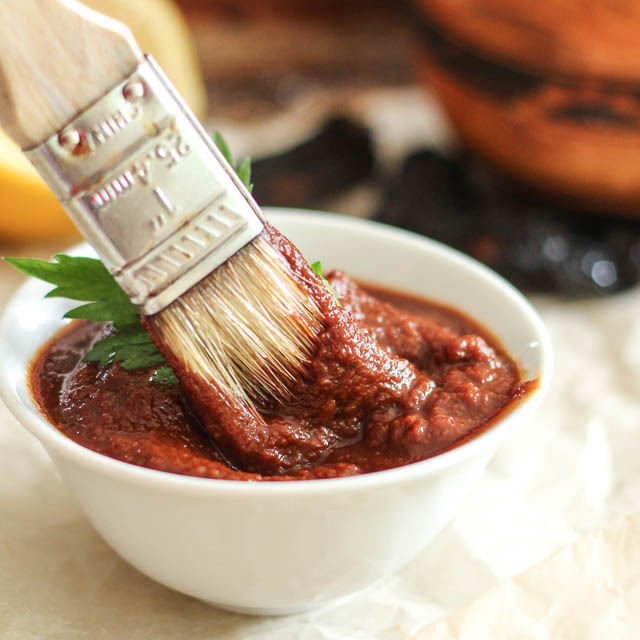 If you want a really smooth BBQ sauce, pass it through a fine mesh sieve (you will have to help it through by swirling it around with a ladle), otherwise, just transfer it straight to an airtight container and refrigerate. This BBQ sauce gets better after sitting in the fridge for a few days and it will keep for 2-3 weeks in the refrigerator.